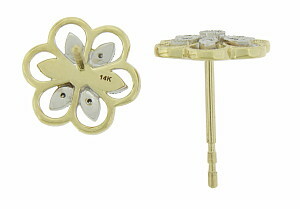 These delicate 14K Bi-color estate earrings are crafted in the shape of cutwork blooms. The center white gold floral figure is set with fine faceted diamonds, each leaf is outlined in delicate milgrain decoration. 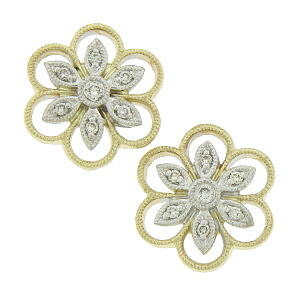 A simple scalloped yellow gold cutwork surrounds the white gold center. The earrings are set on posts and measure 7/16"in diameter.